FREDERICK, MD-Following a terrific showing in the Arizona Fall League, Ryan McKenna was selected to the All-AFL team by MLB Pipeline. Concluding a terrific 2018 season which started in Frederick, the Maine native was also named to the league's Fall Stars game in early November. In 17 games with the Glendale Desert Dogs, McKenna, 21, slashed .344/.474/.594 and posted a 1.064 OPS. He finished with one home run, three triples, six doubles, nine RBIs and 16 runs scored. He placed second in the AFL in slugging and on-base percentage, tied for third in triples and extra-base hits and tied for sixth in batting average. Against right-handed pitching, McKenna slashed .383/.517/.681 with a 1.198 OPS. 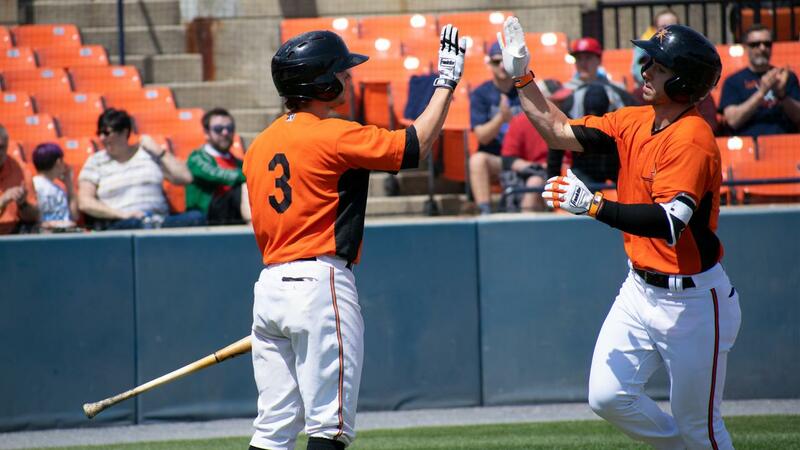 McKenna was chosen for the AFL after putting together one of the best seasons by an Orioles minor leaguer in 2018. Between Frederick and the Double-A Bowie Baysox, he posted a .315/.410/.457 slash line to go with 11 home runs, 53 RBIs, four triples, 26 doubles and 95 runs scored. He led all Orioles full-season minor leaguers in hitting. A Carolina League midseason and postseason all-star, the outfielder batted .377/.467/.556 with a 1.023 OPS in 67 games for Frederick before a promotion to the Baysox. At the time he was called up to the Eastern League, McKenna led the MiLB in hits and on-base percentage while ranking second in hitting, runs scored and placing in the top five in total bases. Originally drafted by the Orioles in the fourth round of the 2015 draft out of St. Thomas Aquinas (NH) High School, McKenna was committed to Liberty University before signing with Baltimore. Planning for the 2019 Frederick Keys season is underway, which includes the Carolina League All-Star Classic on Tuesday, June 18 presented by Visit Frederick. The Keys schedule for next season is available by clicking here, while fans can buy/renew ticket plans for the 2019 season by calling 301-815-9900. To follow Keys offseason news, events and more, fans can visit frederickkeys.com.